The hops for this beer. I was digging through the deep-freeze a few weeks ago and came across the tightly vacuum wrapped remains of 2014’s hop harvest – 270 g (~9.5 oz) of Cascade hops. Not to sure what to with my unexpected bounty, I looked back to see what I did with the home-grown Cascades last year. Turns out last years beer was an Black Imperial Rye IPA – The Black Mamba IPA. Tasting notes (and memory) revealed that this was one of last years better beer, so I thought “what the hell, lets do it again”. Last years beer ended up being under-gravity (more a BRIPA than a BIRIPA) as I had begun experimenting with wet milling my grain and had over-whetted the grain. I’ve now optimized this method, so I hope to hit the desired gravity (1.071) instead of missing it like I did last year (1.059). But what to do with all those hops? The answer – add them all to one beer! For accuracy, the 75 minute bittering addition will be 34 IBU’s of Northern Brewer, but everything else is the home-grown cascade. How do you work in 270 g (over a half-pound) of home-grown hops? The answer is lots of additions – 57 g (~2 oz) at 20, 12 and 5 minutes, plus another 57 g in a 15 minute hop stand (half added at flame-out; half added 7.5 minutes after flame-out). But that leaves 34 g (~1.5 oz) unaccounted for – that would be the prime hops; the ones I put aside into their own little pack as they had the most resin and aroma of the harvest. Those are being held back for a 3-day dry-hop after primary fermentation is complete. 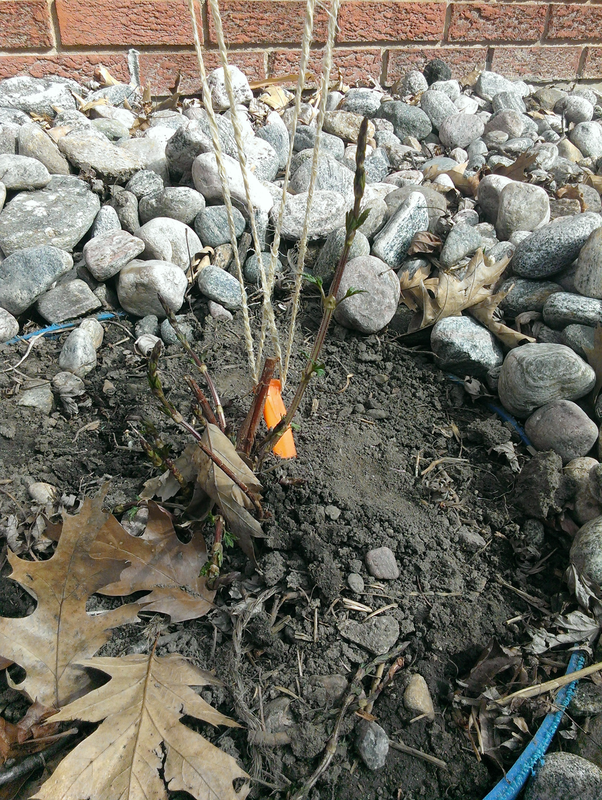 Estimated IBU’s are 67; maybe lower or higher depending on just how bitter the home-grown hops are. Grain bill is pretty much unchanged from last year – good quality Canadian pale malt as a base malt, 25% rye for that refreshing rye crispness, some carafa special II & victory malt to round things out. Again, I am trying Conan, but will coax more ester flavour out of it by under-pitching (50% the recommended rate) and minimally oxygenating the wort. Fermentation will begin at 18 C (65 F, AKA my basements temperature) and ramp up to 22C (72 F) to finish. I’m going all-out, and even altering the water to up the sulphate and magnesium to make the hops pop. 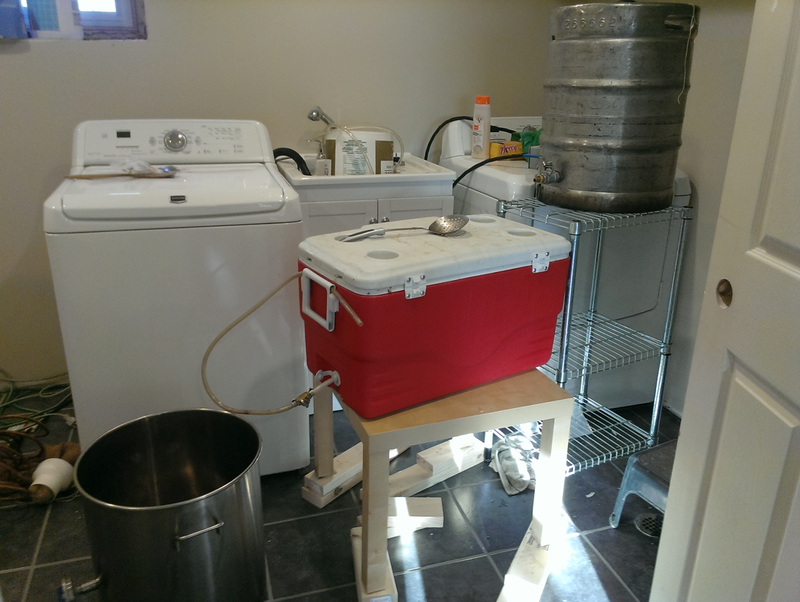 The in-laws are coming over for lunch, so the brewday started early (6 AM). Everything was measured out last night, so I simply plugged in m HLT and started heating water while making SWIMBO & I some coffee. Mash & sparge went without error, giving a pre-boil gravity of 1.052; just one point short of the predicted 1.053 and I have about half-litre more volume than planned, so I’m probably dead-on. 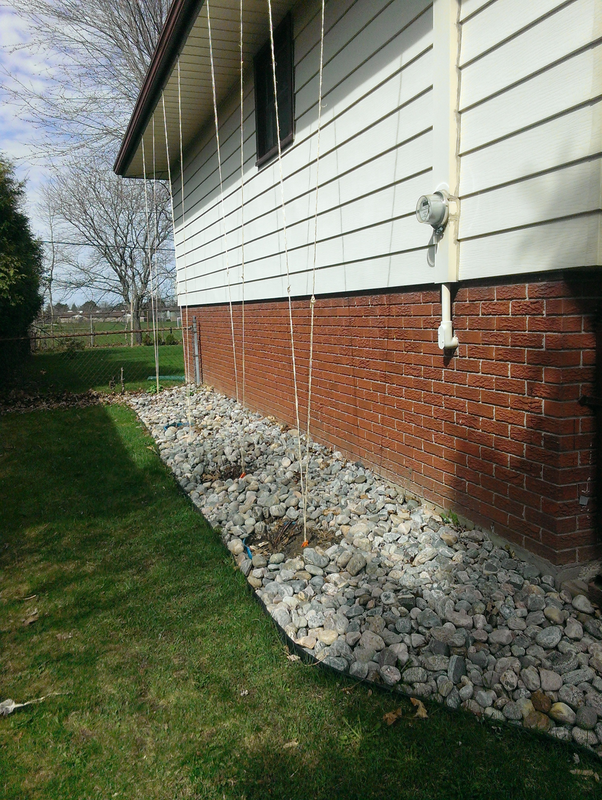 Boil started at 9AM, putting me ahead of schedule (2 pots of coffee helped), so taking advantage of my extra time I got the lines strung for this years hops. For the first time this year I actually got a full-length boil without my propane burner crapping out mid-brew – I’m guessing that’s because the polar temperatures are finally gone. 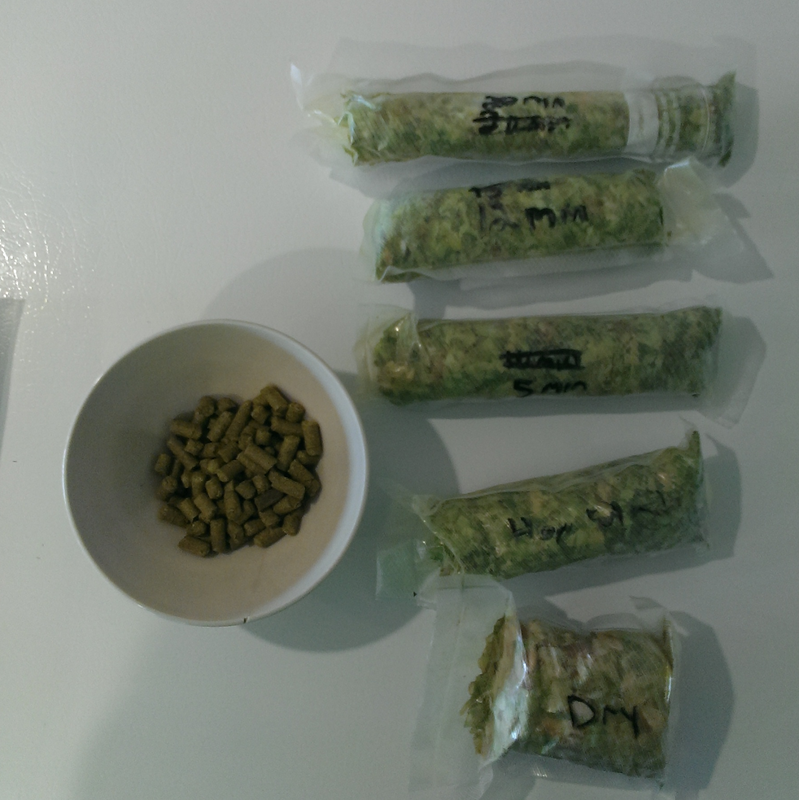 The vacuum-packed hops were like giant plugs and took some work to break-up, but I got them all in. Before I knew it I was cooling the wort – I barely missed my target gravity (1.070 instead of 1.071), good enough for government work! I hope the taste of this beer is as flawless as the brewday!